Experience the goodness of Pure Activated Charcoal! Activated Charcoal is derived from a special high-quality grade charcoal. Charcoal used for treating health conditions is usually "activated" to make it a very fine powder, which increases its effectiveness. 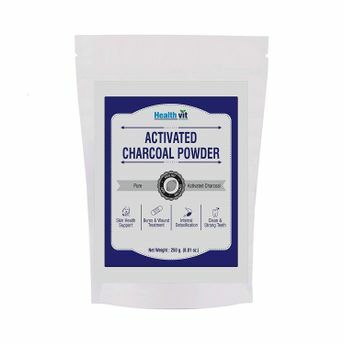 The Healthvit Activated Charcoal Powder is pure powder and has multiple uses. It helps clean and whiten your teeth as well as detoxifies your body. Especially suitable for oily, acne-prone skin, you can use the powder in making a face mask which helps to remove blackheads, impurities, and dirt from face, etc. The activated carbon has been milled to be the ideal powder size for both topical and internal use. Not too 'grainy' to include in your favorite drink, nor too rough for skin masks, creams, etc. Add a little activated charcoal powder to your toothpaste every day to remove stains and for minor mouth pain. Mix a scoop of charcoal powder with coconut or other oil and a little water for a soothing face mask or a cream for your skin and hair. Helps with Digestion. Mix in your favorite drink to help with digestion and to reduce gas and bloating. Additional Information: HealthVit is a Herbo-Nutra (Herbal & Nutraceuticals) segment of Ahmedabad based MNC West-Coast Pharmaceuticals delivering a wide range of quality healthcare products since last 46 years such as Dietary and Nutritional supplements, Medicinal Products and various Skincare Products helping you lead a fit and healthy lifestyle.Their motto is very simple: purest ingredients, stringent processes and high quality guaranteed! Explore the entire range of Masks & Peels available on Nykaa. Shop more HealthVit products here.You can browse through the complete world of HealthVit Masks & Peels .Alternatively, you can also find many more products from the HealthVit Activated Charcoal Powder range.